Over the years Tanalian Aviation has had the pleasure of flying our guests to some of Alaska’s most remarkable places. Here are a few guest reviews from past trips with us. We would love to hear from you. Please take the time to submit your own review and share your experience with Tanalian Aviation. This is one of the most AWESOME things we've ever done! Not only was this our first ride in a helicopter, but to see such amazing sights and beautiful breathtaking scenery was unbelievable. Even though when we arrived the reservation had been mixed up, Nora made a quick call and got things rolling for our tour. She even threw in a couple of T-Shirts for us. Mark instructed us on what to expect and we felt very safe before we even left the ground. I can't say enough about Josiah as a pilot and tour guide. Man, this guy really knows his stuff about Alaska! We learned so much about the area he flew us over. The day was so beautiful and clear we could even see Denali in the distance. What spectacular views! The ride was so smooth and when Josiah landed on the glacier it took our breath away how beautiful everything was. I couldn't wait to get back and post pictures on FaceBook. We received so many "likes" regarding the trip. 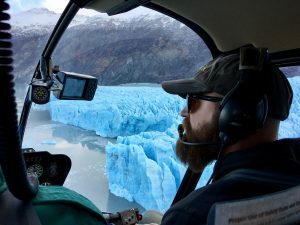 We will definitely take the tour again on our next trip to Alaska and will recommend Tanalian Aviation to anyone that wants to experience the beauty and majesty of the Alaska wilderness. Thanks to this whole company who had prompt & polite service. OMGosh! What an amazing company! The day before we were to fly out of Anchorage my Dad who is 86, Had seen an ad on the Alaska channel for helicopter flights. He asked if my brother, my husband & I would be interested in a helicopter tour. I grabbed some brochures from the hotel as we were on our way to Whittier for a glacier cruise. I called a couple companies who were on phone mail &/or couldn’t return my call til after7pm or we're booked til the end of July. I then called Tanalian Aviation- no phone message, Joel the owner answered the phone. We wanted a flight out of Anchorage for 4 but what was available would have meant we'd be split in 2 groups. He suggested a flight an hour north of Anchorage that would accommodate the 4 of us and would cost less IF we were willing to drive up there & IF he could get it arranged for the next AM. We said "yes" & he text later with a time that worked for us & a price we couldn't refuse! (Thanks, Joel!) This was so last minute for us & they were great at getting this arranged on such a short notice & allowing payment the next AM. We arrived a few minutes before our expected time. Pablo was our pilot. He was so kind to my dad helping him in& out of the helicopter, applying cleats to his shoes, got him a heavier coat to wear & took several pictures with our cameras. He allowed us plenty of time on the glacier & in the air. Pablo was very knowledgeable & seemed to enjoy his job.He even gave my dad a nice gift at the end of the flight! Thank you , Pablo! Thanks to this whole company who had prompt & polite service.My Dad is 86, he never thought he'd have a chance to go to Alaska much less take a helicopter flight & walk on a glacier. He was so happy to have the experience- & I was very happy with the service provided! Thanks again, Joel, Pablo, Doc &Nora! Lief was our pilot. He went over and beyond to try and find moose, bears. We saw both. Even about 8 swans. It was a spectacular trip. The landing on the glacier was Amazing with a capitol A. Truly made this trip to Alaska special. Deciding on a tour on short notice, hotel concierge contacted Doc. As I was without a car, he graciously agreed to pick me up the next day. Very friendly, professional and down-to-earth guy. Joined by a couple at airfield, pilot Leif did a terrific job explaining safety and previewed our tour up the Eagle River. Being solo I had the front seat! Extremely professionally, also fun and engaging, Leif described many details about the city, valley, glacier and the flight in general. Terrific experience, and extra accommodating of my disability. Thanks! This was a fabulous experience for the last day of our Alaskan experience. This helicopter flight was a first for my husband and myself. Our pilot, Evan, used humor introducing us to his helicopter. He told us which parts of the helicopter to walk past and which parts to never walk toward upon entering and existing the helicopter. He quickly informed us of his flying experience and experience in the Air Force. He was serious about watching and noting gauges during takeoff and landing. The flight was smooth. We had a beautiful day. After the dog sledding, upon our return, he gave us significant views of the glacier and searched for animals on the hills. This was a fabulous experience for the last day of our Alaskan experience. 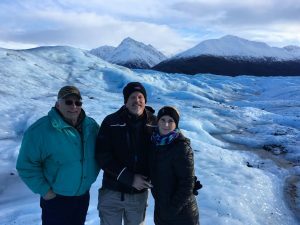 My wife had never been to Alaska, so on a recent visit to Anchorage we decided to see some sights and booked a tour with Tanalian Aviation to do a helicopter tour of the Knik Glacier. Doc (Joe) worked with us a week prior to smooth out some issues in our booking and even drove us up to the Knik Lodge to get picked up by the chopper. Our pilot (John) was amazing, swinging across the landscape to point out mountain goats and sheep on the hills before landing us in an amazing spot on the glacier between two pools of azure blue glacier water. The day was amazingly perfect and we spent a glorious time hiking on the glacier and taking tons of photos (of which both John and Joe were exercising their artistic talents by assisting with photographs). I'll admit when I booked the tickets, I was slightly apprehensive. The tickets were expensive, I'd never flown in a helicopter, and landing on a glacier seemed somewhat risky...plus, I'm a rather large man (6'5", 350+ lbs). I couldn't have been more mistaken...for it was one of the most memorable and worthwhile experiences we've had. The ride was practically spacious, smooth, and the experience well worth it. Special thanks to Joe and John for making our day with such an amazing life experience! We'll definitely tell our friends! My first trip to Alaska one I won't forget. I was in Anchorage for a very short time on business and wanted to see the sights. Doc worked with me to get me on a tour on very short notice! My pilot, Leif, was very knowledgeable about the area and a pleasure to spend a couple hours of my day with. Tanalian Aviation made my first trip to Alaska one I won't soon forget! We were picked up from our hotel by Evan and Erin, taken to the hanger. We met our pilot was Pablo, he took my sister (Tammy) and I out over the breathtaking scenic landscapes, and gave a very informative tour. He flew low and slow over the glaciers, doing a second pass for us to see as much as possible - before a gentle landing near the Knik Glacier. Although we had an unexpected "extended" tour.. 🙂 - we had the best time! Pablo was fantastic...cannot speak more highly of an experienced, knowledgeable, friendly & warm guy! ..We returned back to the hanger with another pilot, Josiah, another knowledgeable and friendly guy.. We had brilliant time out in the snow and up in the air - highly recommend Tanalian Aviation. From two Aussies, who haven't seen all that much snow or picturesque landscapes - this was awe inspiring and flat out breathtaking!!! Hats off to Pablo!!!! The aircraft condition was pristine, it was a pleasure!! Chartered to inspect a remote property for a property appraisal. Pablo was the pilot and could not have been nicer. I have chartered with many different companies over the years and felt very safe with Pablo, who was very careful and very considerate in making sure he did all he could to make the job go well. The aircraft condition was pristine, it was a pleasure. A surprisingly quiet, tranquil helicopter ride into the mountains, just MARVELOUS. Pablo was fantastic, an experienced, friendly pilot who made us want to come back for more. Thanks again! Spectacular Pilot, We had a Blast! Josiah was a spectacular pilot and flew the Raven like it was an extension of his mind! Safety and comfort were paramount with the experience. We had a blast! Awe struck by the beauty of the mountains, water and glaciers. We were up here on business and took some time to enjoy a spectaculur tour to celebrate Veteran's Day with our Paw! We will definitely be back! I had a chance to call the folk at Tanalian Aviation to order some apparel and had a chance to speak to all of the folks via speaker phone..I wanted to thank them for spotlighting Heli Aviation as it's a very small segment of the aviation industry..I wanted them to know I was a newbie in to the rotorcraft industry and their constant discussions on their TV show regarding safety and safe aeronautical decision making is very heartfelt and genuine. The discussion about the clouds, weather and wind are very comforting knowing I am being ingrained with the same safety information and these folks have been doing it for years and years.. I wish all of you safe flying...I know your clients are in very capable & safe hands. "Breathtaking and spectacular views you will ever see"
I am so grateful for Tanalian Aviation and the life time experience that they provided for my daughter and I. It was my daughters 10th birthday and it was a surprise gift to land on a glacier in a helicopter and play on 500ft of ice underneath of us! It was one of the most breathtaking and spectacular views you will ever see. Our pilot was very accommodating and gave so much interesting facts of nature all around us, it was great! The entire experience was unforgettable and it is a day neither my daughter nor I will ever forget. Thank you Tanalian, we can't wait to do it again!! "The most Comfortable and Thrilling Tour"
recommend this tour and Tanalian to anyone going to Alaska! See some of Alaska's majesty in a most unique way. We went out with Pablo three weeks ago to Knik Glacier and it was truly amazing. He was fantastic about putting me in great positions for the best photographs which is important since I'm a photo. He would go higher, lower, make a second (or third) pass, and find great angles. We absolutely loved our trip and would recommend it a hundred times over. We wanted to get married on a glacier and decided to use this company after speaking with Joel, the owner. He was very patient with all of our million questions and dozens of phone calls! In typical bride fashion I arrived at our pickup site over an hour late, but our pilot, Josiah, was very kind and understanding about it. He even had some great suggestions for pictures! This is a great, professional company and we're already planning another trip up! My wife and I used Tanalian for a vow renewal on a glacier. Our pilot, Chuck, was great! Chuck is retired military and his aircraft handling abilities show it. The helicopter was clean, the pilot was prompt, entertaining, and knowledgeable! I would never dream of using another company! "Best Wedding Ever!! Tanalian is the BEST!" I cannot say enough good things about Tanalian Aviation... they made our big day an experience of a lifetime. We arranged our wedding with these guys to get married on Knik glacier, just outside of Palmer, AK. The people that work at Tanalian are really what makes that business so special. They are truly good hearted & go above and beyond to bring out the best. We had the best time for our wedding, thanks to them. It was without a doubt our favorite part of our vacation. We had the most amazing day of our lives and it wouldn't have been possible without Tanalian. Our pilot Mark was amazing! He was very knowledgable, fun, enthusiastic and showed us some of the most amazing places on earth. I recently led a photography workshop that focused on glacier aerials and we used Tanalian Aviation for our helicopter support. I can say that the experience far exceeded not only the expectations of my workshop participants, but my own expectations as well. Our pilot Mark was awesome!! I would definitely recommend Tanalian and can't wait to use them again. 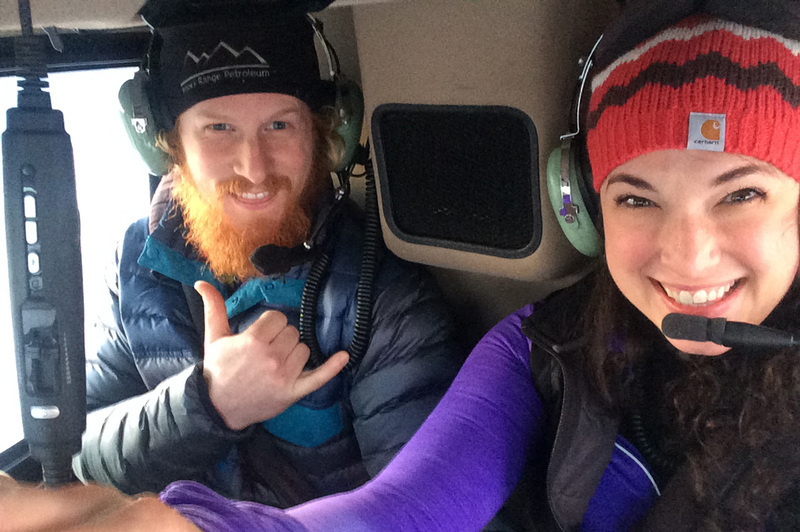 Tanalian helicopter tour was the highlight of our Alaskan vacation. Booking process was smooth and they responded promptly to emails or phone calls. Our pilot, Mark, was fabulous! Helicopter tours are absolutely the best way to take in the vastness and scenery of Alaska. The glacier landing was the ultimate experience and Tanalian Aviation does it best!! We’d love to hear from you! Tell us about your experience on a Tanalian Aviation Helicopter Tour.